For quite some time now, my household has been looking forward to acquiring a Nissan Leaf — the first mass-market plug-in electric car. On Saturday we finally had our first chance to see, touch, and drive one, when Nissan brought 14 cars to World’s Fair Park in Knoxville. This car is an exciting opportunity for our area — a chance to be a leader in changes that should reduce our national addiction to foreign oil, as well as our emissions of greenhouse gases. Tennessee is one of the first states where the Leaf is being sold, and in a couple of years Nissan will start making this car in Smyrna, Tennessee. The process of becoming early adopters of this new technology has been frustratingly slow. It’s been 10 months since we put in a reservation (with a $99 deposit), about 5 or 6 months since an electrician came to evaluate the cost of installing a 240v charging station in our house (cost to be subsidized for us pioneer owners! ), and about 3 or 4 months since we placed our order with Oak Ridge Nissan, but delivery is still at least 3 months away. The Nissan reps who were in Knoxville on Saturday said that only about 150 cars have been delivered to U.S. customers so far. Still, the prospects are exciting. 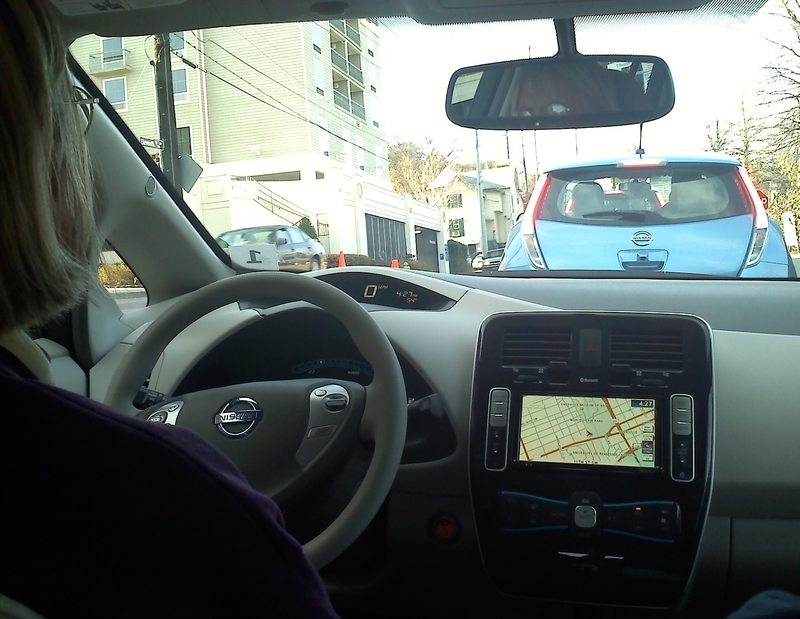 The car is comfortable to ride in and it drives well — although I’m not sure what I think about the fact that it feels even more like driving a computer than our Toyota Prius does. We will be able to use a computer or smartphone to send it messages — for example, to schedule it to recharge during the hours of the night when electricity demand is at its lowest, and even to turn on the car’s heater in the morning a few minutes before leaving for work (while it’s still plugged in). It remains to be seen how the advertised 100-mile driving range will compare with our experience, but we know that’s more than enough for most of our daily needs — and in the early months the car will be sending its performance data to Department of Energy-funded researchers to help provide an information base to benefit future electric car owners. It’s exciting for me to know that our region will be one of the first to have public car-recharging stations throughout the area (including stations at ORNL, where we work, and at our local Nissan dealership). Given Oak Ridgers’ commitment to leadership in energy technology, I look forward to our Leaf seeing plenty others of its kind around town. Update on March 20, 2011: Our wait will be longer as a result of the recent earthquake near Sendai, Japan. Nissan sent e-mail saying “As a consequence of the earthquake and tsunami, a delay in the scheduled delivery date of your Nissan LEAF™ is unavoidable.” They still can’t say how long the additional delay will be. The Oak Ridge Environmental Quality Advisory Board’s long-awaited Climate Action Plan is available in draft form for public review — download it here. The plan describes recommended measures for reducing energy consumption (and thus emissions of greenhouse gases) by city government and by the community at large. I missed last Tuesday’s public meeting about it (I was out of town), but I’m definitely looking forward to hearing what people think of the recommendations. City Council is scheduled to receive the final plan in October. I’ll be interested in receiving people’s comments, but people who want to affect the content of the final plan should send comments on the plan to Athanasia Senecal — her e-mail name is asenecal and the city e-mail domain is cortn.org. By most measures, Saturday’s forum “Greening Oak Ridge: A Community Forum for Shaping a Green Future” was a smashing success. There were about 100 people there, with a diverse variety of perspectives, and those people seemed to be thoroughly engaged in generating ideas about what Oak Ridge needs to do to make Oak Ridge a sustainable community for future generations. Sustainability is often about the environment, but more broadly it means “meeting the needs of the present without compromising the ability of future generations to meet their own needs.” This is no small challenge. The global financial collapse unfortunately means that we are now depending on those future generations to rescue our present economy. This forum was focused, however, on an environment-related sustainability challenge: sustaining the future environment and the future economy in the face of the impacts of the continuing buildup of greenhouse gases in the atmosphere — and taking action toward stabilizing greenhouse gas concentrations and the climate. On Friday, I heard the news that a group of 26 big companies and several environmental organizations calling themselves the U.S. Climate Action Partnership had declared their support for reducing the nationâ€™s greenhouse gas emissions by 80 percent from 2005 levels by 2050. Thatâ€™s a frighteningly ambitious goal facing us, our children, and our childrenâ€™s children. Itâ€™s even more frightening to realize that climate experts say that the goal of 80 percent reduction from 2005 to 2050 is not nearly ambitious enough. In May of last year, the City Council passed a resolution committing Oak Ridge to take action to address greenhouse gas and air pollution emissions, and to take a leadership role in addressing of climate change as an issue. The Environmental Quality Advisory Board was charged with advising the City in the development and implementation of milestones to accomplish these objectives. As a first step in reducing Oak Ridgeâ€™s impact on the global atmosphere, EQAB needed to figure out how big that impact is and what we do that produces that impact. At the forum, Athanasia Senecal (photo), a UT intern working with the City, told about the inventory of greenhouse gas emissions from City government and from the community as a whole. The biggest source of City government emissions is (surprisingly) the water and wastewater sector — mostly pumping water uphill in our beautiful but hilly terrain. 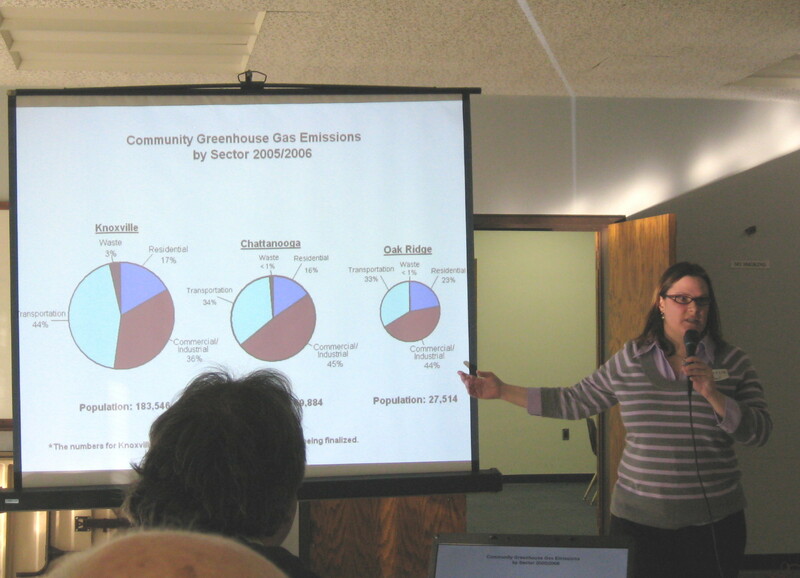 City government emissions are, however, only about 1 percent of the community total. To help define actions for the community to take, part of EQABâ€™s task is to make recommendations on city actions and policies to help ensure sustainability in the coming years and decades. * What steps do you think Oak Ridge should take to become a greener community? * What should the city do to reduce our carbon footprint and build environmental sustainability into our infrastructure?